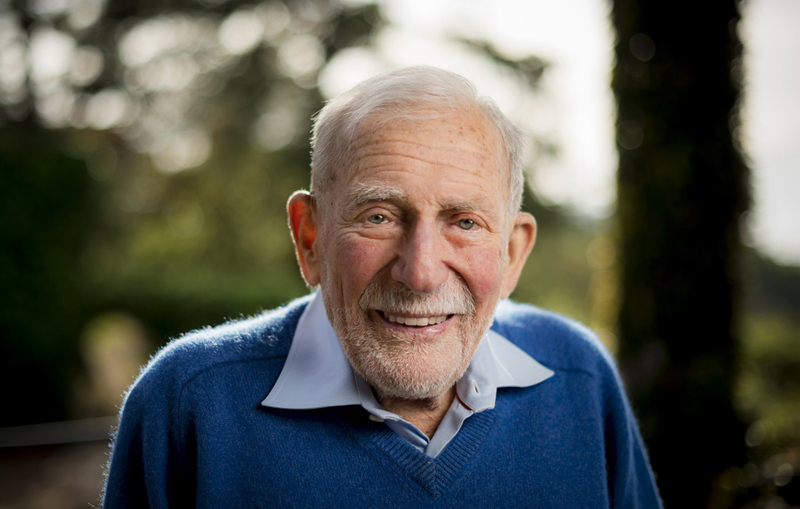 As a geophysicist at Scripps Institution of Oceanography at the University of California San Diego, Munk made groundbreaking observations of waves, ocean temperature, tidal energy in the deep ocean, ocean acoustics, and the rotation of the earth. As an advocate of science and broader scholarship, Munk served as an advisor to presidents and the Pentagon and conferred with public figures including the Dalai Lama and Pope Francis. His convictions led him to refuse to sign a loyalty oath required by the University of California during the peak of anti-communist fervor in the early 1950s and his passion helped create the architecture that would become the defining style of the Scripps Oceanography campus. In pursuit of a romantic interest who vacationed in La Jolla, Munk applied for a summer job at Scripps in 1939. The infatuation with the young woman passed, but Munk acquired a new love for San Diego. After receiving his master’s, he returned to Scripps and was admitted as a PhD candidate. Munk was married briefly to Martha Chapin in the late 1940s. In 1953, Munk married Judith Horton, a member of one of San Diego’s most prominent families. With Judith’s own background in architecture, she would become a partner with her husband in creating the distinctive look of many of Scripps’ research buildings, including the complex that houses the Institute of Geophysics and Planetary Physics (IGPP), a University of California-wide research initiative housed at Scripps. Walter and Judith Munk would become entrenched in the social life of Scripps with their La Jolla home serving as a salon at which students, visiting intellectuals, artists, and scientists would gather to discuss ideas. The two were inseparable in the field as well. Improbably, the couple trekked across the Soviet Union in a Land Rover at the height of the Cuban Missile Crisis in 1962 to reach an oceanographic station at Gelendsik, near the Black Sea. They lived in a Samoan fale when Walter conducted fieldwork on the origin of very long Pacific swells described in the educational film, “Waves Across the Pacific.” (View parts 1, 2, and 3 of the film here.) The two were partners in thawing the Cold War as they could, serving as science ambassadors through visits to colleagues in China and the U.S.S.R. in the 1970s.